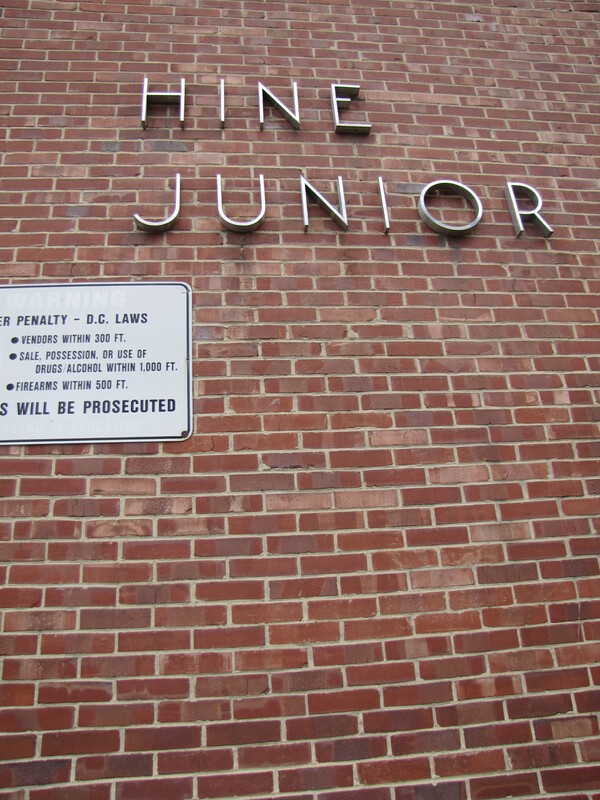 The FOIA request was filed by attorney Oliver Hall, counsel to the Hine Coalition, a group of Capitol Hill residents who have appealed the Zoning Commission’s approval of the Hine project to the DC Court of Appeals. Initially, DMPED offered the Office of General Counsel some 378 emails which had been withheld from disclosure. OGC reviewed all of the emails and found the vast majority of them did not contain proprietary information that would result in substantial harm to the developer. OGC did make four exceptions to the order to disclose documents: emails containing bank wiring instructions, legal arguments analyzing alternative legal structures for the condominium portion of the Hine project, insurance policy numbers, and emails to other DC government agencies. A copy of the email from the OGC can be found in the Library on CHC. A group of Capitol Hill residents who are appealing the decision of the Zoning Commission on the Hine project has written to Councilmember Wells to urge him to support their efforts for reconsideration of the PUD order by the Commission. A copy of the letter to Wells is below. Oral argument before the DC Court of Appeals on the resident’s appeal has been scheduled for September 26th at 9:30am in Courtroom 1 of the DC Court of Appeals, 430 E Street, NW. We are a group of Ward 6 residents who write in response to your recently stated support for the Planned Unit Development (“PUD”) that the developer Stanton-EastBanc, LLC proposes to build on public property where the former Hine Junior High School is located. We have serious concerns about several aspects of this deal, not least of which is the lack of transparency regarding its basic terms. Many people have no idea, for example, that the District will convey ownership or control of this valuable public property to Stanton-EastBanc at a sharply discounted price, or that District taxpayers will pay for many of the “public benefits” Stanton-EastBanc claims its PUD will provide. The PUD also appears to violate key provisions of the District’s zoning regulations and Comprehensive Plan, which are intended to ensure that new developments are compatible with existing neighborhoods, and that the District remains affordable to all residents – not just the wealthy. Because the PUD will be located in the heart of the Capitol Hill Historic District, we are particularly concerned about its excessive size and height, and the negative impact it will have on the historic character of our community. The PUD will top out at seven stories and 94.5 feet – more than twice the height of the historic rowhouses and other buildings surrounding it – and will tower over everything in the vicinity. Remarkably, however, the Zoning Commission approved Stanton-EastBanc’s PUD without even addressing this extreme disparity in height, despite the Comprehensive Plan’s express requirement that developments in historic districts “shall be consistent with the height and density of contributing buildings in the district.” 10 DCMR § 1011.11. We are therefore raising our concerns in an appeal to the District of Columbia Court of Appeals. 5. The affordable housing units will be significantly smaller than the market rate units, and will be segregated in the North Building, without access to the “luxury” amenities in the South Building, in violation of the Inclusionary Zoning regulations’ purpose of “ensuring the benefits of economic integration for the residents of the District,” 11 DCMR §2600.3(e), as well as Comprehensive Plan policies intended to promote an “inclusive city,” 10 DCMR §§ 100, 500.3, 500.14. We believe the foregoing facts demonstrate that this oversized PUD will not only cause permanent damage to the unique character of the Capitol Hill Historic District, but also that it represents a gross waste of taxpayer assets. The District is transferring ownership or control of the Hine School property to Stanton-EastBanc for a fraction of its fair market value, and District taxpayers are further subsidizing the PUD by paying for “public benefits” that Stanton-EastBanc is required by law to provide. Councilmember Wells, we have always supported redevelopment of this property in a reasonable manner that will enhance the Eastern Market neighborhood, rather than destroying the qualities that make it a beloved attraction throughout the District, and for visitors nationwide. Will you not investigate the foregoing facts, and join us in our effort? If you still support Stanton-EastBanc’s PUD, however, please respond to this letter by explaining why you believe this seven-story, 94.5-foot PUD is appropriate in an historic district currently zoned for building less than half that height, and why the taxpayer subsidies identified herein are justified. In view of your mayoral candidacy, the voting public deserves to know where you stand on such matters. We recognize that your position as a Councilmember is a demanding one, but due to the urgency of this matter, we respectfully ask that you respond to this letter within two weeks, by August 23, 2013. Thank you for your time and consideration. Last Monday night, the DC Zoning Commission gave final approval to Stanton-Eastbanc’s request to change the zoning on the Hine site to accommodate greater density and height for their planned development. The vote was 4-0-1, with Commissioners May, Trunbull, and Cohen joining Chair Hood in voting to move the project forward. Commissioner Miller, a new addition to the board, abstained since he did not participate in deliberations. Prior to the vote, the Commission noted that, in an unusual move, Stanton-Eastbanc had agreed that the entire Construction Management Agreement and the entire ANC’s Memorandum of Understanding with the developer will be included in the yet-to-be-issued Zoning Order. It could be a month before the Board issues the Zoning Order on the project. Commissioner May threw in the towel on his efforts to find a way for 55 foot trucks to head in and head out of the Hine project’s loading dock. He said it was not his preference that the trucks back into the dock from 7th Street, but the issue has been “beaten to death” and his concerns were somewhat mollified by the limitation that deliveries can take place only between 11:00 p.m. and 7:00 a.m.
Commissioner Cohen asked that the designation “superior” be removed as a characterization of affordable housing units, explaining that the placement of most of those units in a separate building and the differences in the amenity package for those units continued to trouble her. Commissioner May, on the other hand, felt that the units deserved the superior designation. The language had been included, in part, because the designation of some elements of the project amounted to a necessary finding by the Zoning Commission that the developer had fulfilled what it had pledged to the community in terms of a quality project. In the end, the term was removed as it applied to the affordable housing units but left as a finding by the Zoning Commission to characterize the overall project. 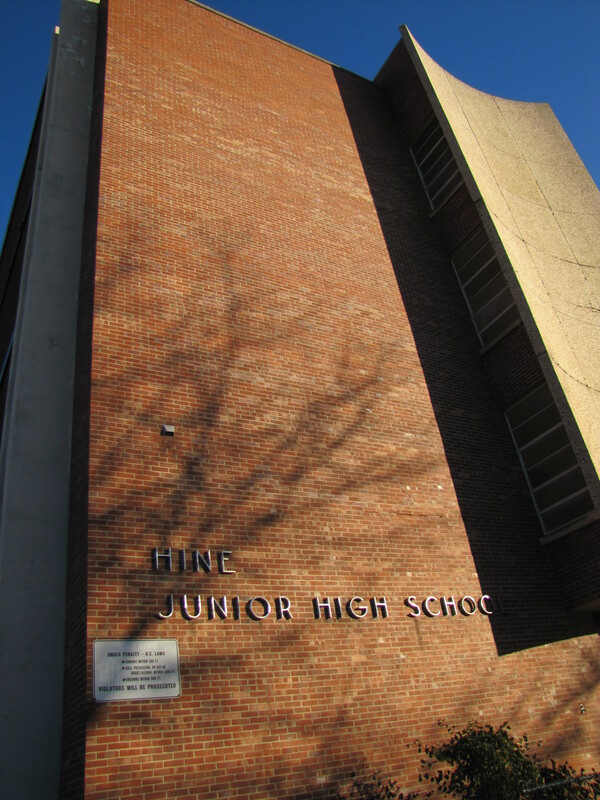 After the Zoning Commission order is issued and permits issued, demolition of the existing Hine School structure can begin. That demolition is scheduled to begin in the fall of 2013. The DC Zoning Committee will hold a hearing Thursday evening on the EastBanc-W.D.C Partners’ application for a public unit development (PUD), filed in June of 2011, for its West End Library project. In addition to building a new library and fire station in lieu of payment of some $20 million for the property, the developers plan a residential building with 172 market-rate one, two, and three bedroom units, supported by 190-197 underground parking spaces. Originally, plans included 52 affordable housing units above the new fire station. Now it appears that EastBanc may be seeking relief from the requirement that the affordable housing units be part of the project, a requirement of DC law for any new residential construction project in the District. EastBanc did not provide details of the firehouse and affordable housing in the PUD, leading community members to speculate that EastBanc is hoping to have the requirement dropped. This may be because EastBanc has stated that it would need the city to provide a subsidy to make the affordable housing component viable, and, thus far, the District has failed to come up with one. As readers of this blog know, EastBanc has partnered with Stanton Development on the construction of the Hine project. The Deputy Mayor’s office cited Stanton/Eastbanc’s willingness to make affordable housing a component of the project (15% of residences) without a city subsidy as one major reason why the partnership was awarded the contract. As readers of this blog will also recall, the Stanton/Eastbanc team continues to cite its commitment to affordable housing as the reason why the scale and the density of the Hine project cannot be diminished in response to concerns and criticism from the community. One of EastBanc’s partners in both the Hine and West End Projects is Dantes Partners, which appears to be a two-person development company operating out of a townhouse at 72 V Street NW with no current website address. The public face of Dantes is Buwa Binitie, who served as affordable housing consultant for EastBanc on both the West End and the Hine projects. Binitie’s trademark seems to be winning development contracts by offering more affordable housing than other developers. Previous to his work at Dante’s Partners, Binitie administered and managed the implementation of the New Communities Initiative for the Deputy Mayor of Economic Development, and he currently serves on the five member board of the DC Housing Finance Agency. In July of 2010, Lydia DePillis of Washington City Paper ran an article suggesting that Dantes Partners success at winning city contracts might be attributed to Buwa Binitie’s political connections.